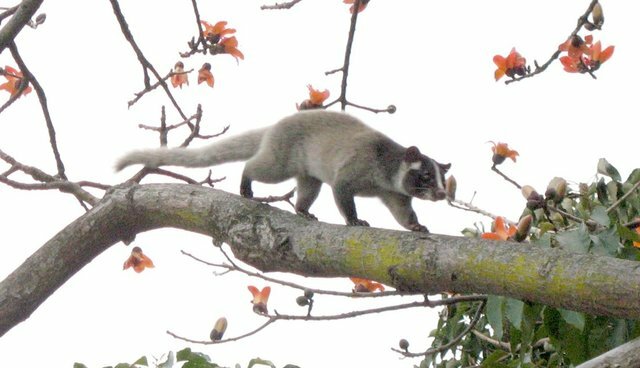 A wayward palm civet was recently trapped the Indian Parliament building, according to India's Economic Times. To their credit, Parliament staff quickly phoned representatives from Wildlife SOS (the same animal welfare organization that rescued Raju the elephant), who were able to save the civet -- but not before the cat-like creature caused a bit of consternation. The appearance of a "strange- looking" visitor from the animal world inside the Parliament complex sparked panic within the heavily-fortified compound and threw the security staff there into a tizzy. Upon arriving at the New Delhi parliament building, Wildlife SOS found the dehydrated civet hiding behind a television set. The civet is now recovering, and will be released once healthy. "Delhi is very fortunate to be home to such unique and endangered wildlife and we should all be working harder to ensure that green areas remain to provide these animals with cover and food," Wildlife SOS co-founder Geeta Seshamani told the Economic Times. Although Asian palm civets are considered a species of "Least Concern" by the International Union for the Conservation of Nature, deforestation poses a threat to civet habitats. In Indonesia, civets are also caught and farmed for their poop, used to brew civet coffee -- a big problem for solitary animals that'd prefer to roam through trees.